Passengers of all ages loved it, staff and volunteers were delighted, and doubtless Father Christmas thought it pretty special too. 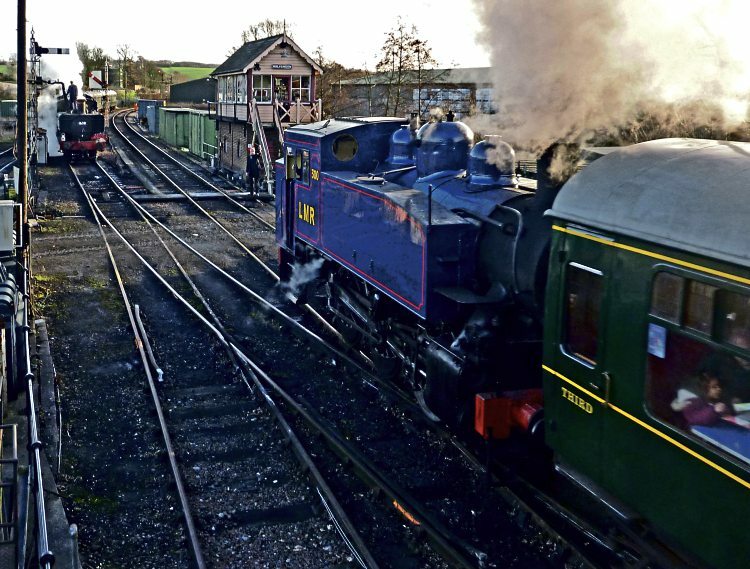 A humble 0-6-0T had returned to service in time for the Kent & East Sussex Railway’s Santa Specials, resplendent in blue livery enhanced by red lining that drew admiring glances and approving comments whenever it steamed into view. The engine, a member of the distinctive Southern Railway USA class, has appeared in a number of guises in its 75-year life, including Nos. 1960, 70, 30070, DS238, and now, 300. Built in 1942 by Vulcan Iron Works of Pennsylvania for the United States Army Corps of Engineers, the 0-6-0T was shipped across the Atlantic in 1943, one of 382 in the class that saw service variously in the UK, western Europe, the Middle East and North Africa. It operated in the UK as War Department No. 1960 until the end of hostilities, when it was stored at Newbury Racecourse station with 41 other members of the class, and subsequently became one of 15 bought by the Southern Railway for £2500 each, and numbered 70. The Southern Railway retained one of the engines for spares, and put the other 14, including No. 70, to use at Southampton docks, where their short wheelbase was ideal for the line’s sharp curves. It became No. 30070 after Nationalisation in 1948 and remained shedded at Southampton (71I) until August 1963, when it was transferred to departmental stock.